Make a statement with your next set of flyers printed by Design One Printing. Our full color flyers separate your business from the competition. Whether you are aiming for a creative and informative piece, or using flyers as part of your overall marketing strategy, Design One Printing is the way to go. Do not let your flyer fade away amongst the rest. Instead, choose a quality flyer from Design One Printing. Our professional designers are instructed to create a rapid and eye catching design for your flyers. Crafting the message for your flyers is important. You want your flyer to be easy to read and attention grabbing. Our professional designers can help you create a flyer that will be noticed and have the impact you desire. Flyer printing involves a few basic steps. In order to have a unique flyer printed in Las Vegas or Henderson, it’s best practice to consult a print shop that specializes in printing and design. You can start by contacting Design One Printing to learn how to design a proper flyer marketing campaign and reach your customers efficiently. Businesses have long forgotten the value of printed flyers. When a potential customer wants to learn more about your business, it can be of the utmost value to show them exactly what you offer with some pictures and content. This can help spur of the moment purchases and can also give your prospects something to remember you by when they are making a purchase decision in the future. Flyers are meant to be simple and to the point. Flyers should not be a jumbled mess of pictures without any text. Before even starting with your design ideas, you should consider who your ideal customer is, and who will be looking at your sheet of paper. If you are a restaurant, it’s important to include your most popular menu items, so customers have an idea of what your best food items are. Finally, consult a professional to review your flyer design and make sure it will print well on your paper. Have questions about designing, printing, or mailing flyers? Contact us, or get a free printing quote here. Flyers are a great way to extend your marketing program to reach more customers. They are inexpensive and easy to order from a local printing company. You can add your custom logo to a flyer to increase recognition of your brand. 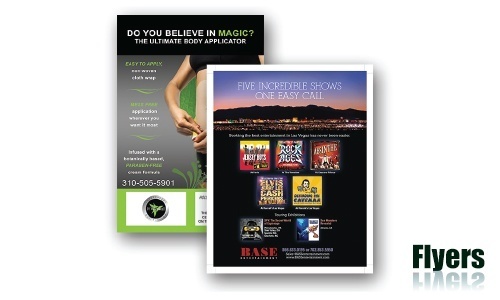 Your printing company can create a flyer that highlights your special promotions. There are varieties of marketing techniques that work to attract new customers. Choose flyers with full color printing to make them look more professional. Send flyers through the mail as part of an effective advertising campaign. Other marketing strategies include email, postcard and newsletter send outs. Market to the kind of customers you want to attract. Identify your target market by defining your customer’s characteristics that include geographical location. This a great plan when you want to send out flyers that are more effective. Your primary market are customers who need or want your product or service. Spend your advertising dollars on attracting customers in your primary market. This can be accomplished with flyers, postcards, emails and newsletters. Study your current customer base to get the answers you need for future marketing strategies. If you understand who needs your service, then this will help you zero in on potential customers. There are a number of effective ways to ensure your flyers are noticed. The headline on your flyer should hook potential customers into wanting to read more about your company and products or services. Have testimonials printed on them from real satisfied customers. Researchers say that over 70 percent of people trust reviews from other customers. Include a recent photo of you or your business. People are more likely to connect with a photo and want to learn more. Make sure you have an effective call to action at the bottom of your flyer. Make it easy for potential customers to connect with you. Include phone numbers that are answered by employees or yourself. Most people do not want to leave a message on a recorder. Employees answering the business phone will make your company look more professional. Make sure you have a professional website and put the address on the flyer. People are accustomed to shopping online and can quickly look up your business. Offer a special promotion on your flyer that is for a limited time only. This creates urgency for your potential customer to call soon. Remember that potential customers form their opinion of your business by your flyer. Have questions about flyer printing? Contact us, or get a printing quote here.